It’s Thursday, so that means the new Fortnite week 7 challenges are here for you to conquer, so let’s get you a jump start on planning your Battle Star collecting activities. The Fortnite week 7 challenges look to be one of the tougher sets of weekly challenges to date, so it might be a good idea to find some friends to coordinate with on these. 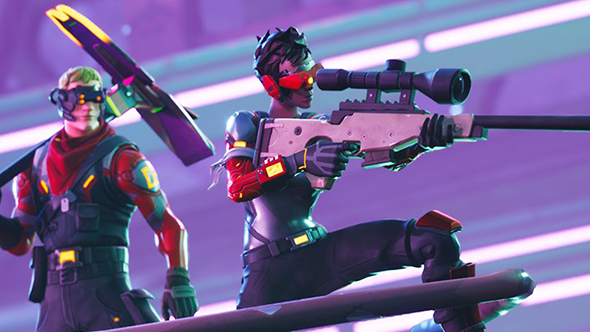 The Fortnite Week 7 challenges are live now and, as always, you’ll still be able to complete challenges from previous weeks. This week, though, the Blockbuster skin unlocks, so if you’ve been staying on top of the weekly challenges, you’ll have that to look forward to. Fortnite might be the most popular, but which reigns supreme? Here’s our list of the best battle royale games on PC. But before we get into the Fortnite Week 7 challenges, be sure to check out the Fortnite Week 1 challenges, Fortnite Week 2 challenges, Fortnite Week 3 challenges, Fortnite Week 4 challenges, Fortnite Week 5 challenges, and the Fortnite Week 6 challenges to make sure you’re up to date on Battle Stars. Here are the Fortnite week 7 challenges and how to complete them. This one shouldn’t be too tough – just knock it out at the beginning of a few matches when everyone’s scrambling to find their first weapons. Risky Reels is the drive-in movie theatre on the north-west corner of the island, just north of Wailing Woods. Head that way as soon as you jump out of the Battle Bus, and you should see a chest on top of a building just north of the theatre on your way down. There’s another chest inside on the ground floor, and several more chests in some of the vehicles parked in the area. This one shouldn’t be too hard – you just have to eat Mushrooms, Apples, and Hop Rocks. Mushrooms, which provide a +5 buff to your shield, can be found in abundance in Wailing Woods and Moisty Mire, usually growing around the base of trees. Apples are found at the base of trees scattered throughout the map, so keep your eyes peeled for those. The best place for Hop Rock foraging is probably Dusty Divot, which has them strewn all over the place inside the crater. 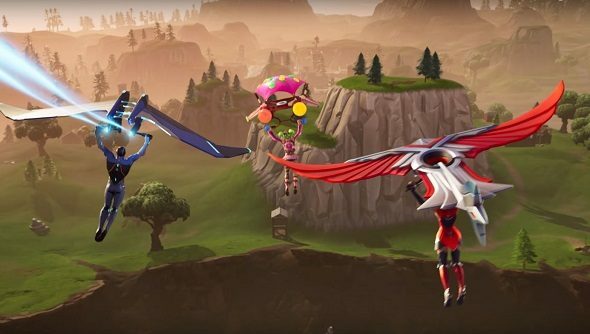 Get into the World Cup swing in the best way possible with this Fortnite week 7 challenge. There’s a soccer pitch just north and at the centre of Pleasant Park, to get you started. Then the final Fortnite pitch is south of Pleasant Park and north of Greasy Grove. 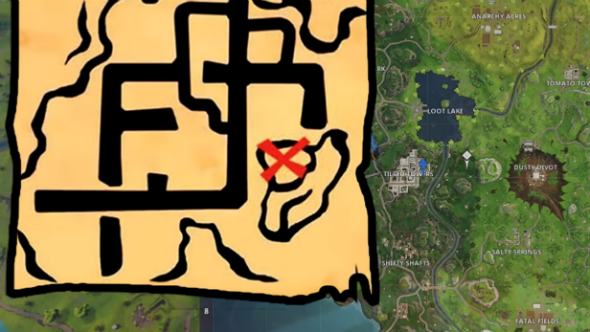 The Pleasant Park treasure map will send you all the way to Tilted Towers – as found by Ghost Ninja on YouTube – so beware that kill zone if you drop there. Find the hill to the south east that overlooks the densely-populated area, reach its summit, and that’s where you’ll get the Battle Star. We’re back in familiar territory with Assault Rifle Eliminations. In fact, I’d go so far as to say the Assault Rifle is probably the go-to weapon of choice for most players, so despite this being one of the week’s ‘hard’ challenges, for most folks it’s going to just mean playing Fortnite normally. Grab some magazines and go to town. Shifty Shafts is the mine just east of Greasy Grove in the island’s southwest quadrant. The underground tunnels are tight and good for getting the drop on unsuspecting opponents, but it’s an easy place to get ganked as well. Above ground, the buildings provide cover, and there’s a nearby hilltop that makes a good sniping location. Hang out here long enough to get three kills, and you’ve got your ten Battle Stars.